My camera should be arriving today. I am so excited! I woke up at an ungodly hour, but I know how I am and that I wouldn’t be able to fall asleep, so I just got up and rolled with it. I finished up my photos from the night before. The crew of the Cheng Ho is so sweet (there are more of them than guests) and high fives divers after each dive on our way off the skiff back walking back to the dive deck. I taught them how to do the fist bump instead of the high five. I went to see the Komodo Dragons today at the Komodo National Park. They are these huge lizards and just seemed to laze around but I hear that they can be pretty aggressive. There were many rangers with big sticks to keep them under control. And this is Kevin and Graham being silly. They might be the next snack for these dragons. 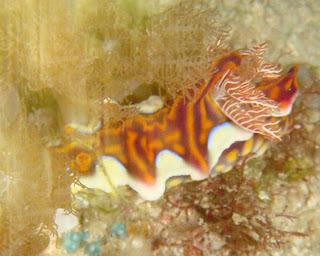 Hmm... after flipping through the book this also might be a Chromodoris verrieri. This picture doesn't really do it justice. These have a really unique structure. 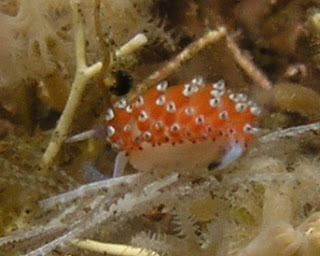 They have the normal rhinophores and gills but behind the gills, they also have two big appendages. Wow, what a God awful picture... but to my defense I was still shooting with my Sony Cybershot. This thing looks like a big leaf of lettuce - but it's crawling! Sagaminopterons are very rare so this was awesome! I was I could have gotten a better shot! This nudi is also known as the solar nudi. They ingest zooxanthellae from coral which the nudi incorporates into its own system. 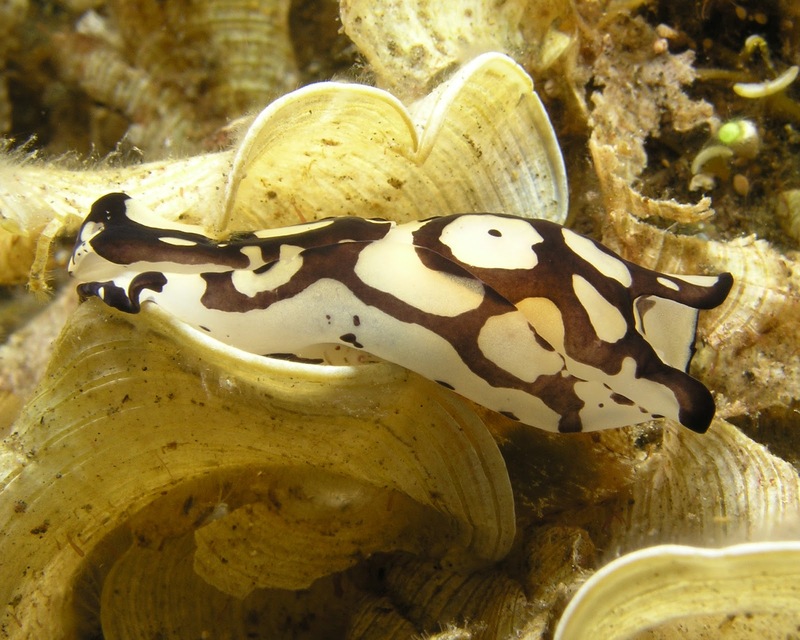 Through photosynthesis, the zooxanthellae produce nutrients to feed the slug! These are often found feeding on the eggs of the Spanish Dancer. Again, doesn't do this one justice. 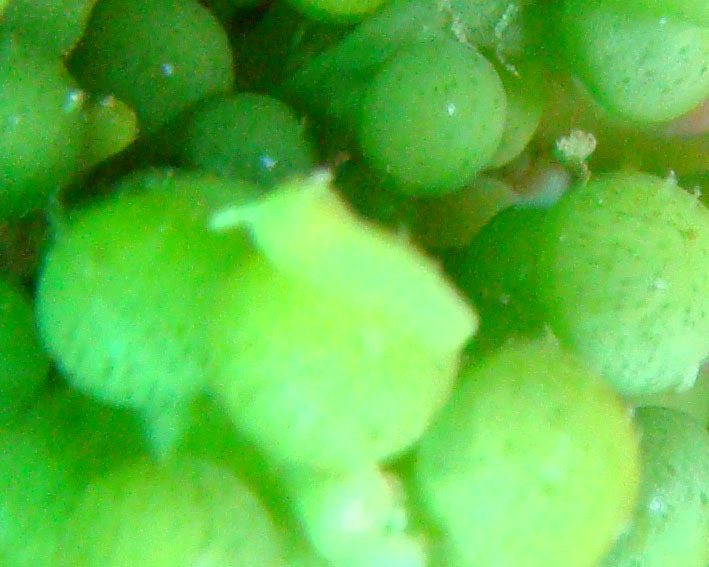 OK, I'm sure you don't even know what you are looking at but this is an itty bitty green slug on top of a grape like coral. I'm not sure I could have even caputed this with my good camera... so this is just documenting proof that I saw this. Um, ok... I know. So my Sony Cybershot goes into this "Shaky Mode" sometimes. I'm not sure why it happens or how to make it stop, so I just took a picture the best I could. 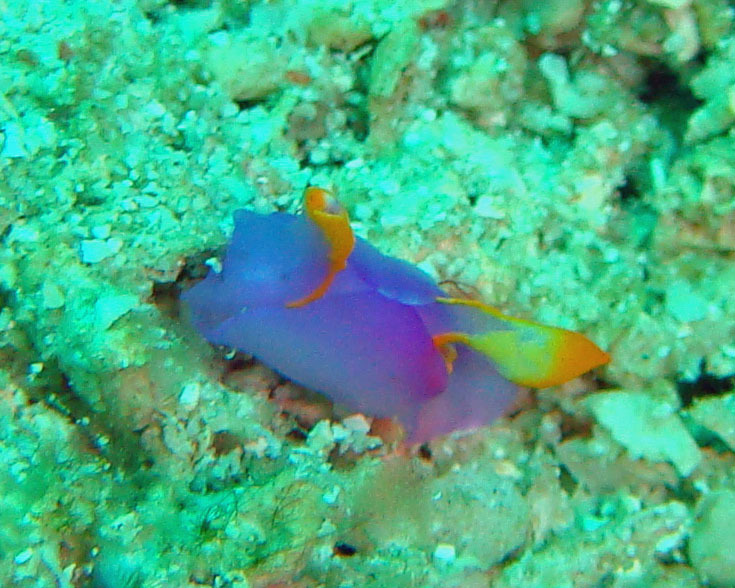 This nudi is GORGEOUS in real life! 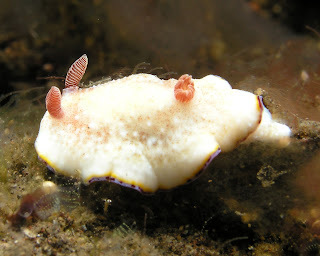 So, Elysia are in the order Sacoglossa, not the true Nudibranchia Order. 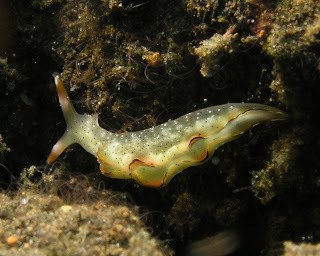 But the rules for this trip state that if the slug is included in the "Indo-Pacific Nudibranchs and Sea Slugs" book, it counts. So I'm up to 24 on day two. Not too shabby!